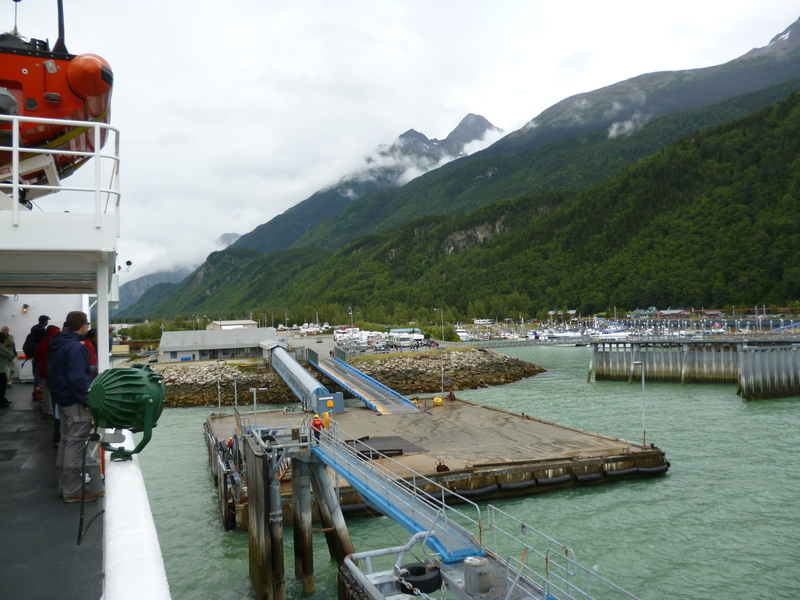 The next leg of our trip is the ferry ride on a few of the Alaska Marine Highway ships with stops along the way to our final departure port into the heart of Alaska at Haines, Alaska. 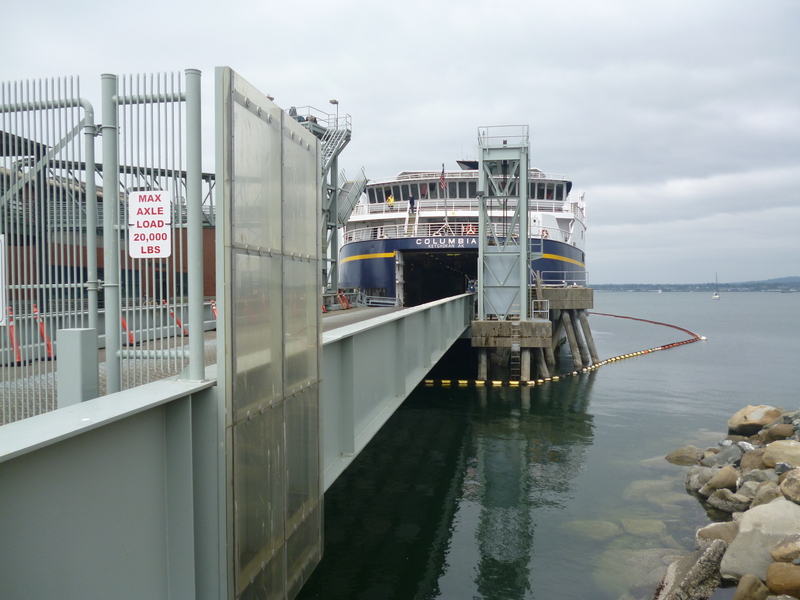 The most southern port on the highway, and our point of departure from the lower 48 was Bellingham, Washington aboard the M/V Columbia. These ships carry vehicles of every size from motorcycles to 18 wheelers. The upper deck is only cars, but the lower deck held every type of RV and truck. Here was one self-contained convoy that loaded during our trip. I wonder how easy it is to get the Smartcar loaded behind the cab? Our original plan was to get off at the first stop in Ketchikan, but the boat that was scheduled to take us from there was taken out of service. 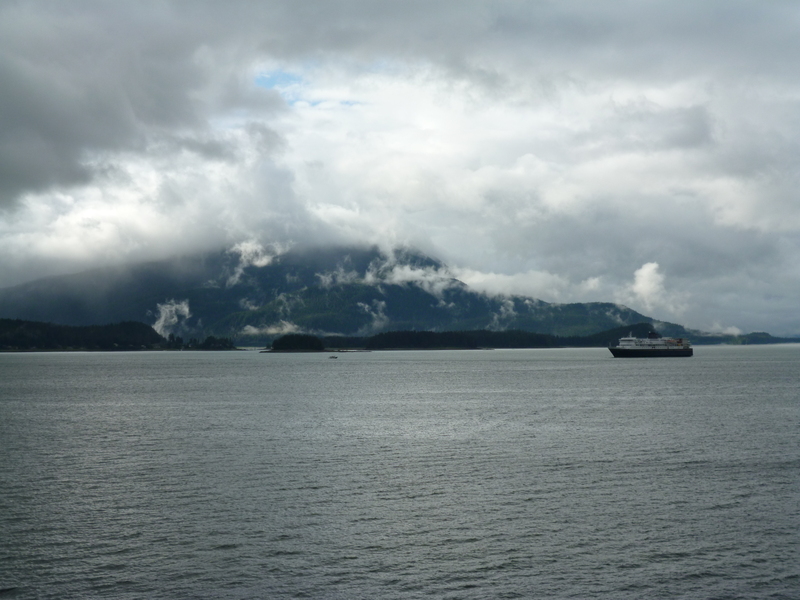 Therefore, we changed our route a few weeks before we left to go all the way to Skagway and then return on the M/V Columbia to Sitka, Alaska, our intended second stop. 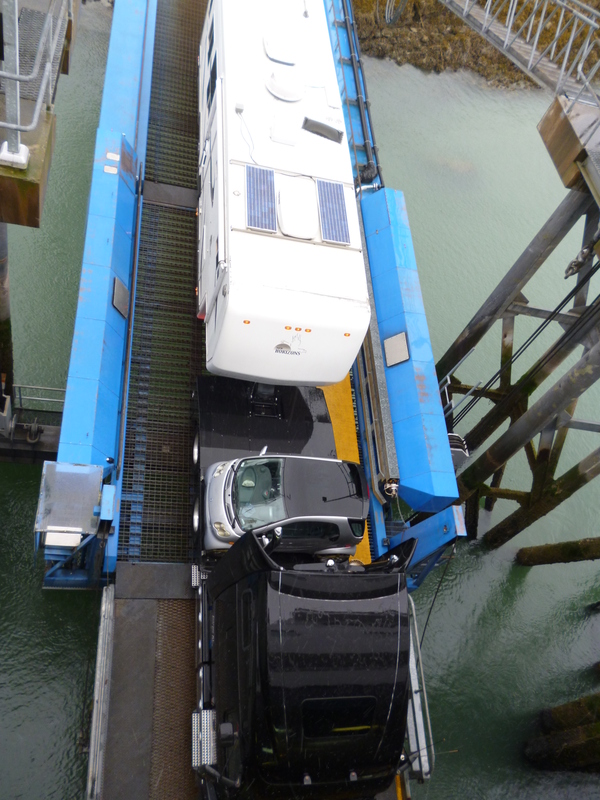 Because of this, our vehicle would be on the ship for 4 days (us too) so it was the second to the last vehicle loaded at Bellingham. A little further back and the roamer would have been swimming. Our M/V Columbia route took us from Bellingham to Ketchikan, to Wrangell, to Petersburg, to Juneau, to Haines and to Skagway over three days. 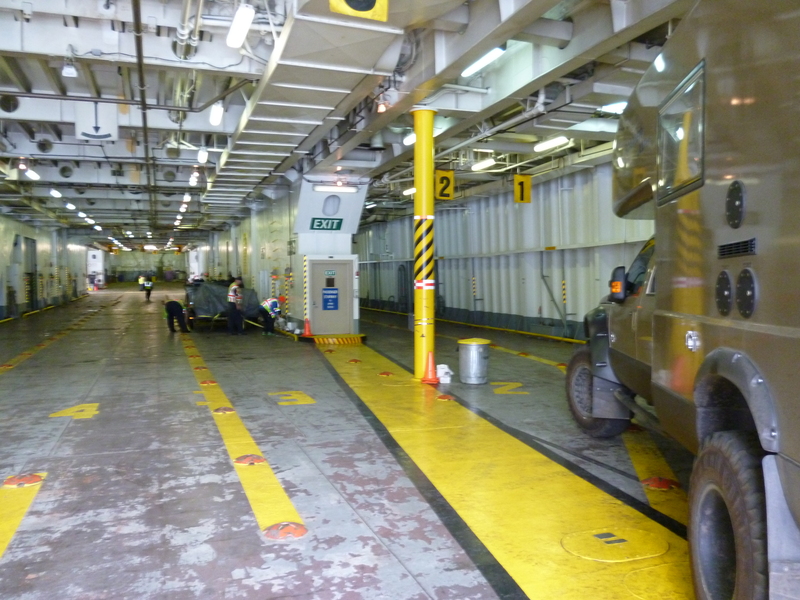 At each port, vehicles got off and got on using just one door into the ship. The crew was amazing that they were able to off-load and load all the vehicles without moving ones already aboard around. We had to reposition the roamer at Skagway to make it easier to get off at Sitka. The roamer was the one of the few vehicles left onboard to make the return trip. We were worried that the freezer full of great food would not last for the three days without solar or external power. 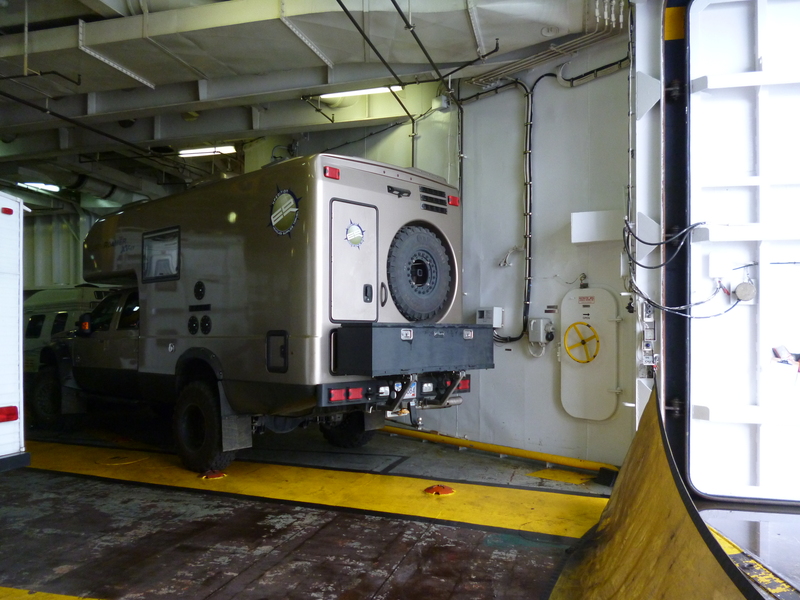 The camper batteries had gone down to 58% charge by Sitka and then re-charged to 92% during the brief time that I ran the roamer to reposition it on the ship to Sitka. You got to love this vehicle. 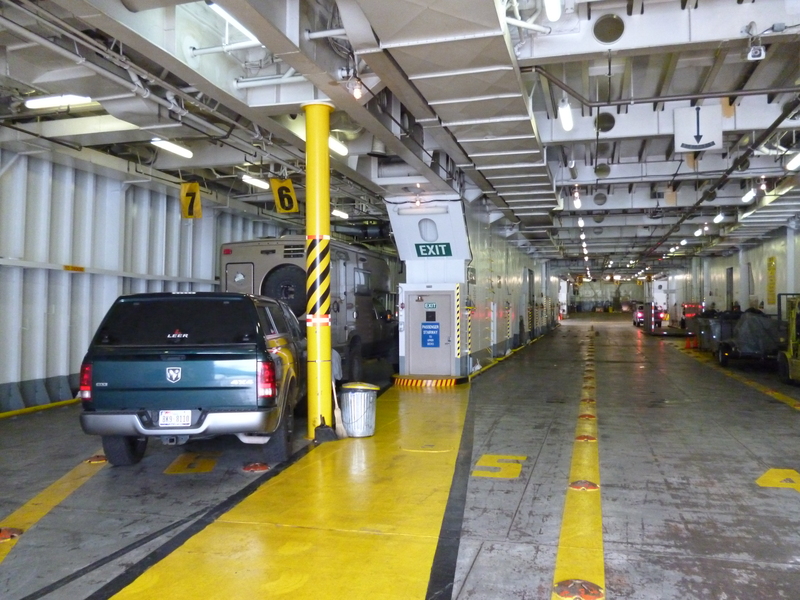 The Alaska Marine Highway ships are not cruise ships, and the crew are state worker (no tipping allowed). While the commercial cruise ships docked in the downtown berths, our docks were typically a few miles away from town. This actually worked out better since it allowed us a nice hike at our stops to stretch our legs after just sitting, reading and chatting with the passengers and crew during the hours on the ship. 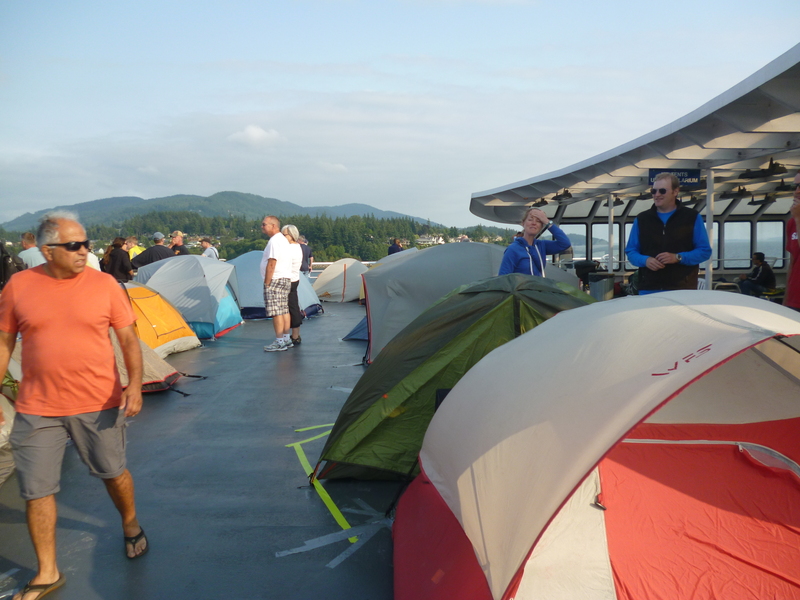 Many folks did not get rooms for the multi-day trip, instead they just threw up a tent on the aft decks to camp. The covered part of the outside aft deck even had heat lamps to keep the folks crashing in just sleeping bags on lounge chairs warm through the night. Luckily a room became available when we changed our itinerary so we had beds and a shower for the trip to Sitka. 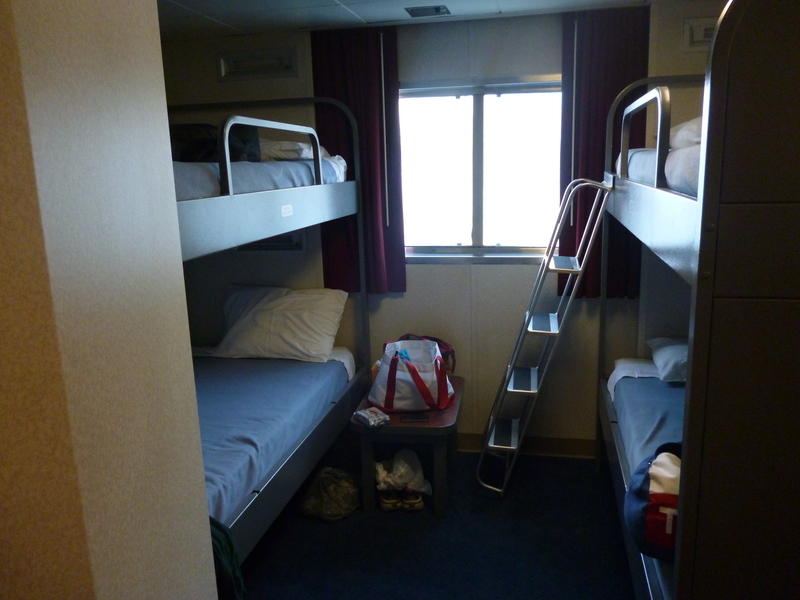 Given that the weather was a little damp most of the time aboard, a room was a very good thing. 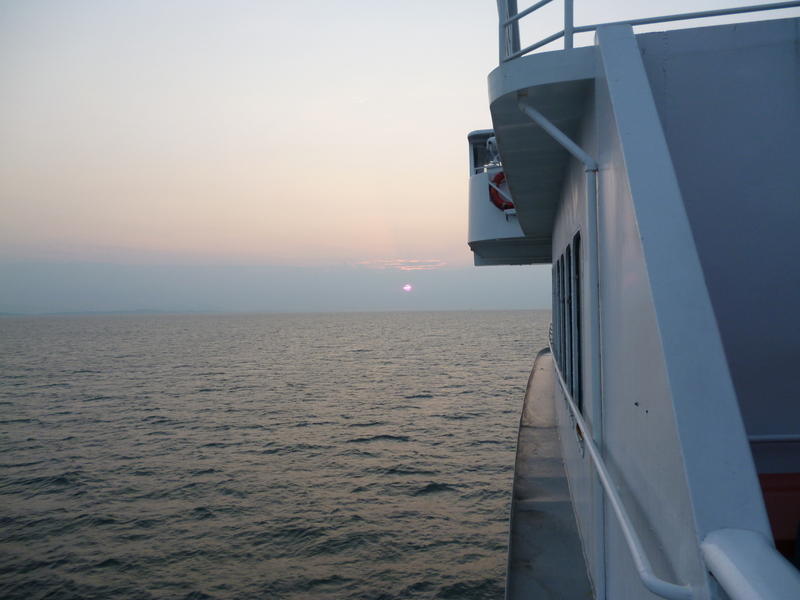 The first day aboard was a pure steaming day, no stops. 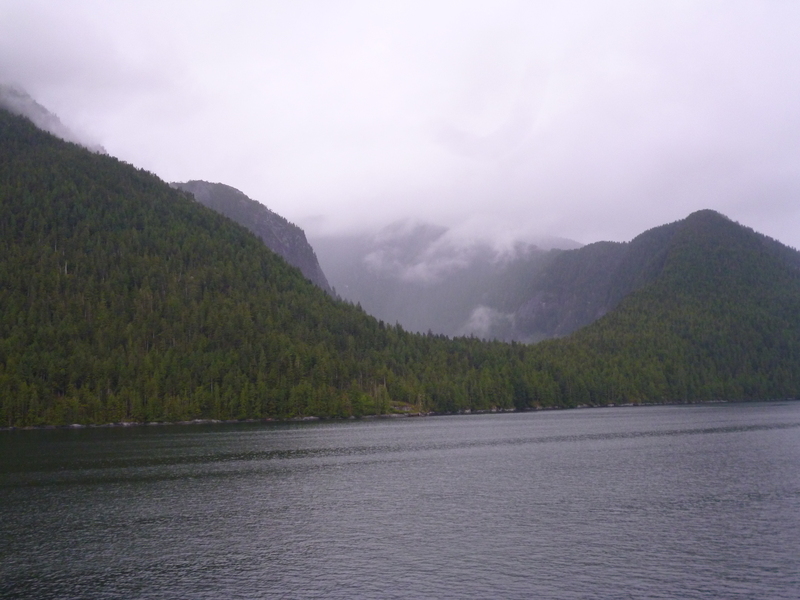 We saw a few whales and many eagles on our way to Ketchikan. 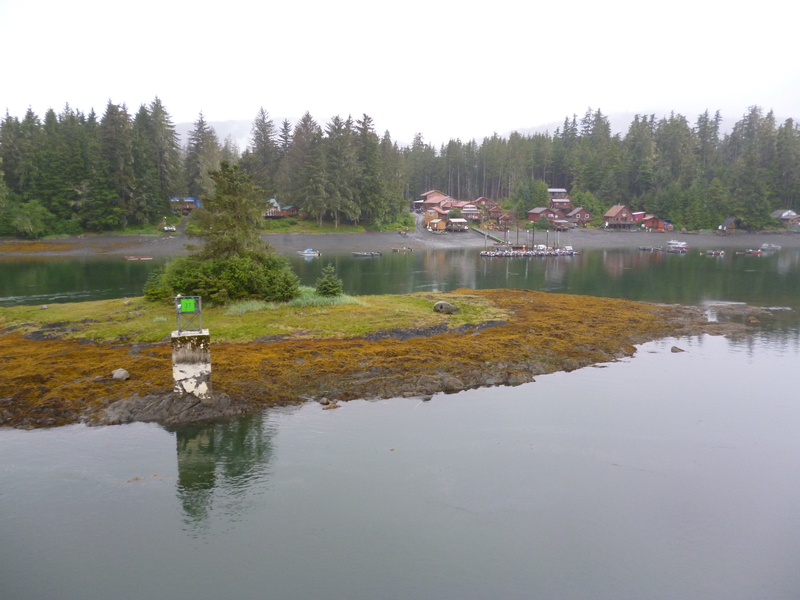 The waterway runs through the hundred of islands along the British Columbia and Alaska coast, some as big as Connecticut and others as small as a pile of rocks. We saw a whale breeching in one of the channels ahead, but then the ship turned and motored up the other side of the island. 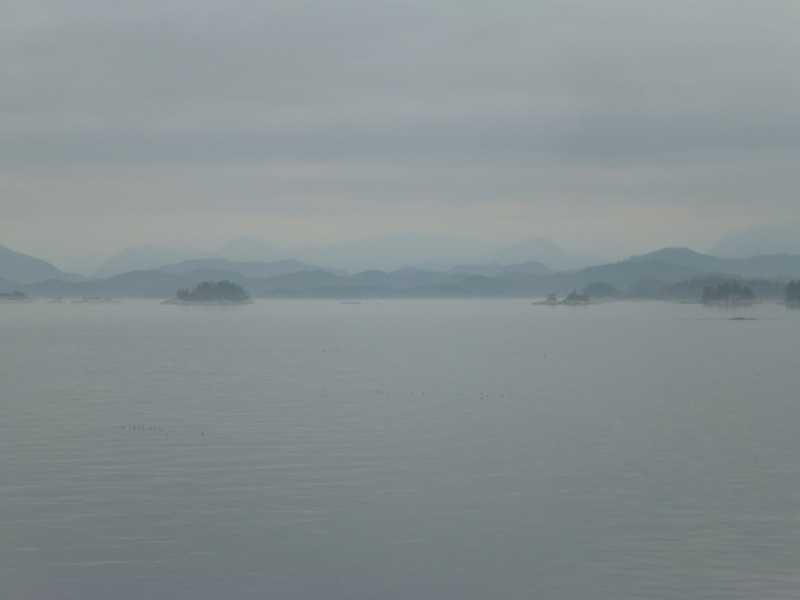 We never got a picture of the whales or their spout mist, but the landscape scenery was beautiful even during the foggy, drizzly days. I guess that’s an advantage of living in the desert. A nice rainy day is a wonderful thing. 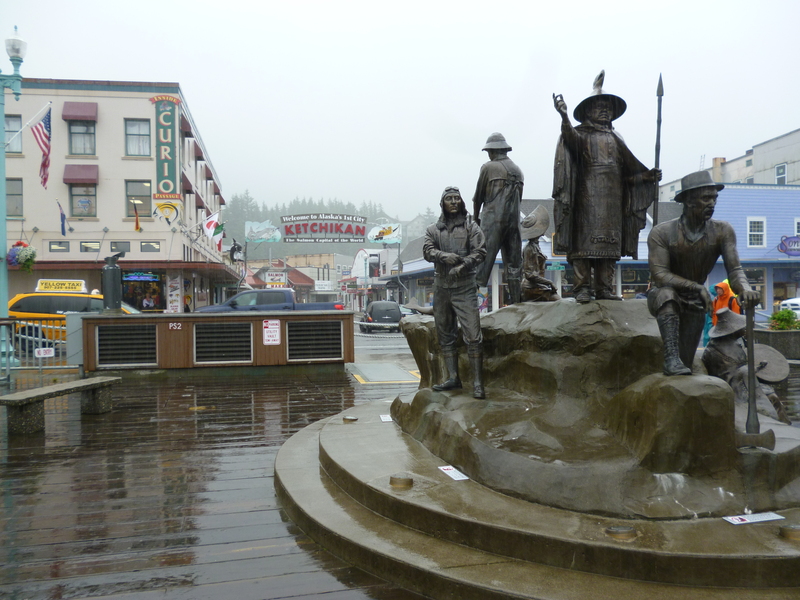 We got off the ship at Ketchikan while it was at port instead of a couple of days as originally planned. We visited the museums and visitor centers there that were quite interesting. 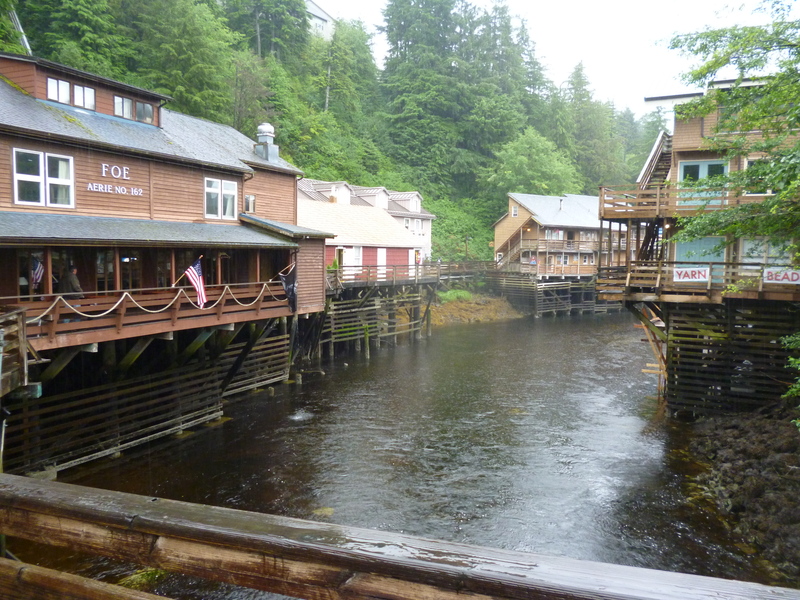 The town is only about 4 streets wide and a salmon creek cuts through the back side of town, where the bars and brothels used to be located in years past. Now the buildings along Creek Street are historic (although I’m sure they were then too), and contain shops for the tourists. 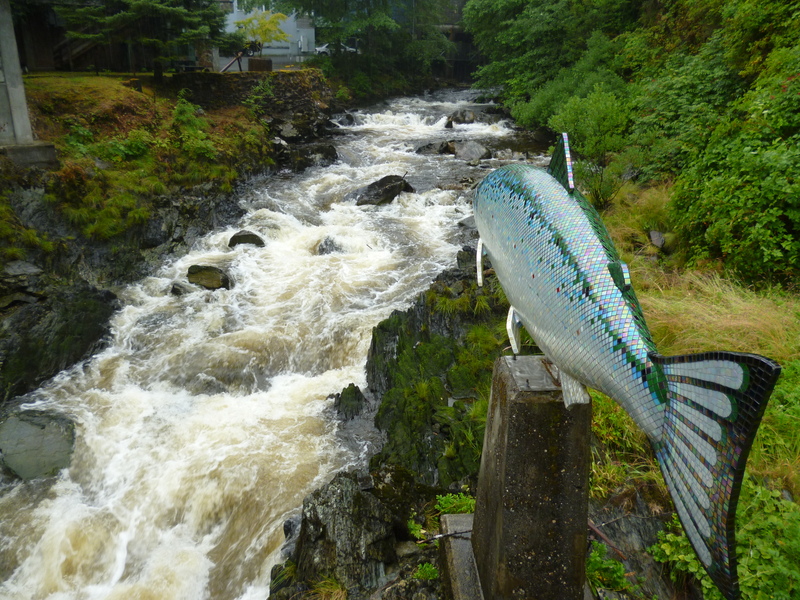 It was said that the men only talked about fishing while on Creek Street and only Creek Street while out fishing. The waterway varied in width from open ocean sections and far away islands to tight channels. 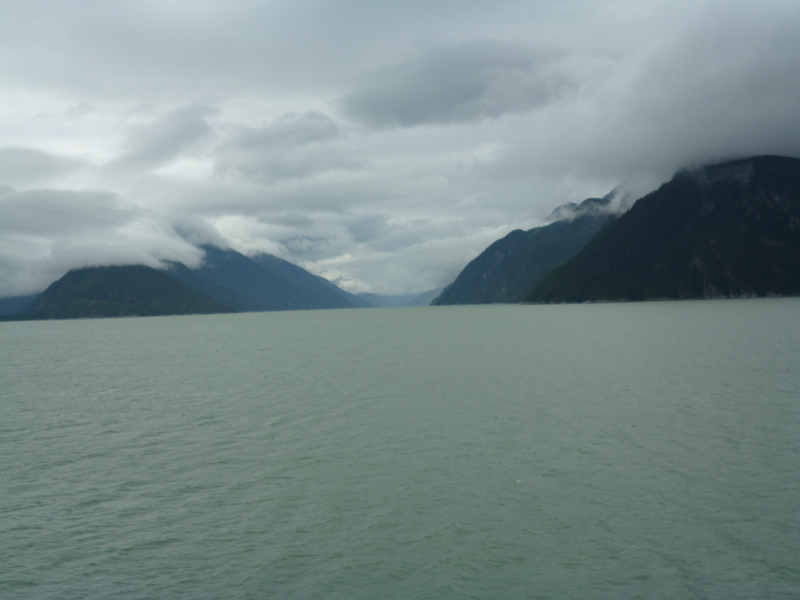 The Wrangell strait was a narrow section, where only one large ship can go through at a time. At Skagway we made the turn back to Sitka. We didn’t get a chance to get off at Skagway since I was in the car deck waiting to reposition the roamer during most of our dock time. Skagway was the place all those folks climbed the hill heading into the wild Alaskan wilderness and gold country back in the early days. 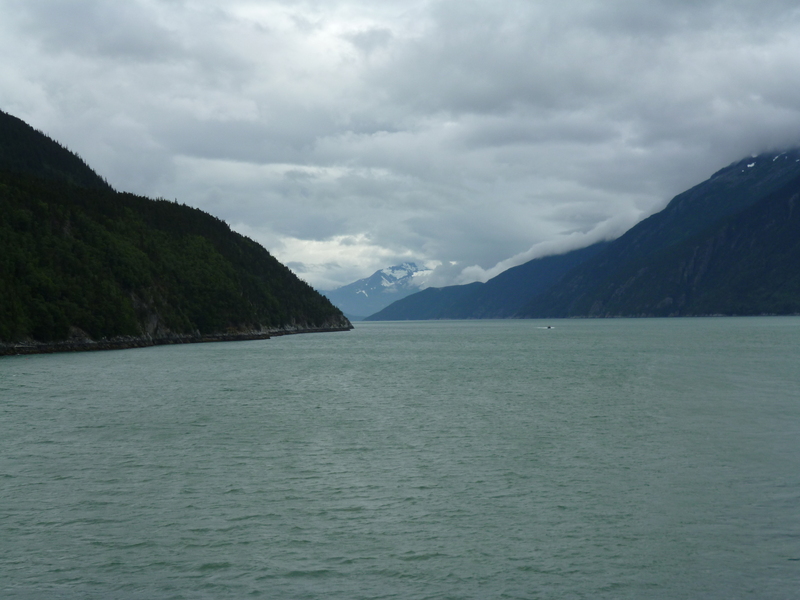 Looking back down the channel towards Haines was very beautiful. 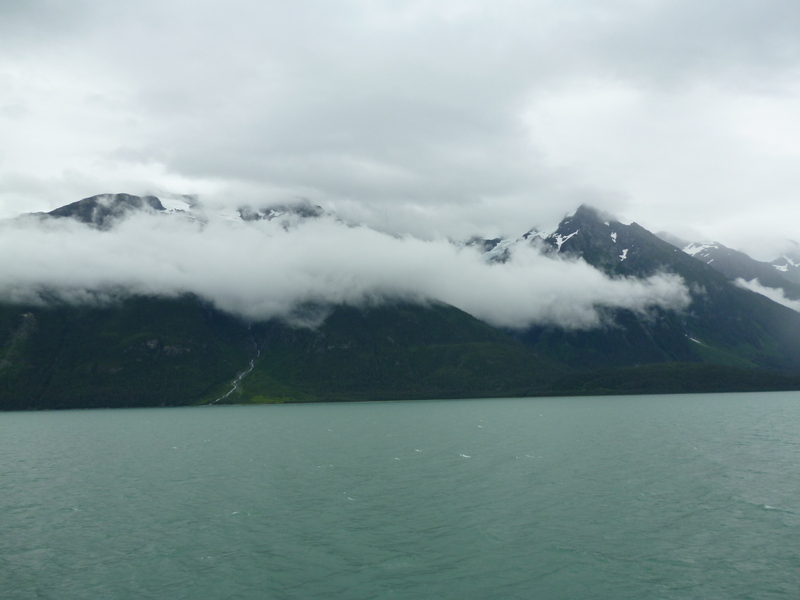 We left Skagway expecting to wake up the next day nearly to Sitka. However, we woke to find ourselves back at the Juneau docks with a ship engine in repair. At one point we had to reposition the ship to allow another of the ships to come in and port. The ship was finally fixed, but we missed the tides for a critical section between Juneau and Sitka so we’ll arrive in Sitka about 12 hours late. Instead of two days there to explore we’ll only have a day and ½ before we will be back in Juneau for a couple of days of exploration. While the ship travel has been interesting and the dining room food yummy, we’re both ready to hit the road again and explore the land on our own schedule in the roamer.